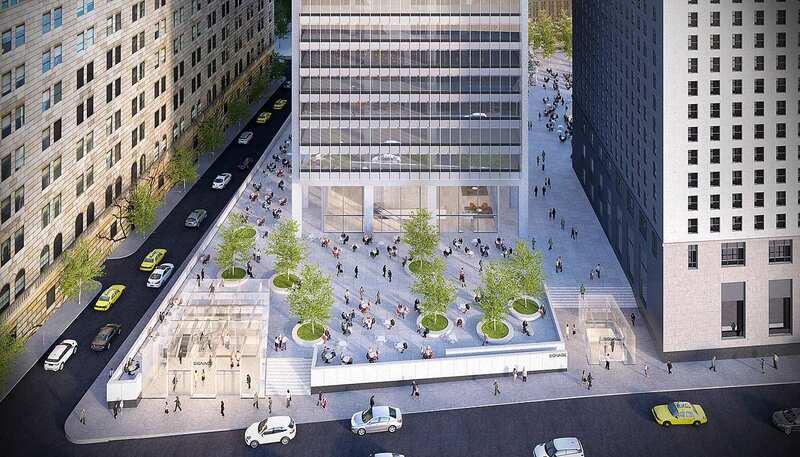 A modernist plaza in lower Manhattan is glass cube–free, for now. At their monthly meeting last night, Community Board 1 (CB1) heard from members of the public about changes to 28 Liberty, SOM‘s modernist office building and plaza. 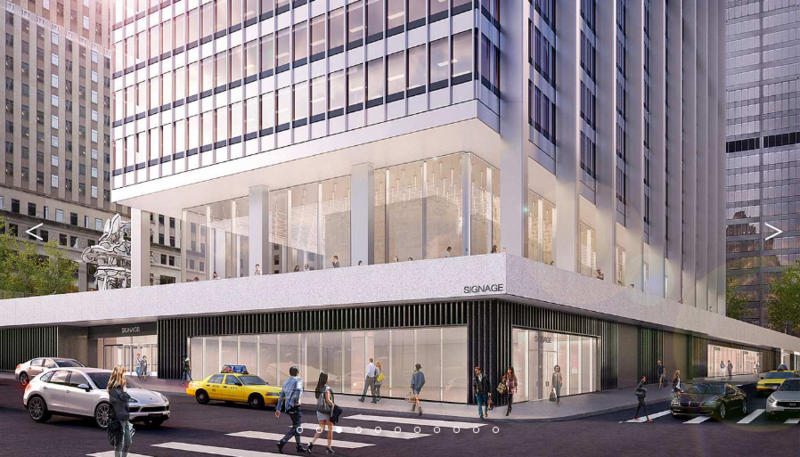 The owner and developer, Fosun, has commissioned SOM to add three glass pavilions to increase access to the plaza’s below-ground retail. Although the scheme received Landmarks Preservation Commission (LPC) approval in August of last year, the plans cannot proceed unless Fosun gets approval to modify a restriction in the deed that forbids structures higher than six feet from rising on the plaza’s surface. Prior to LPC approval, the community board approved SOM’s design in March 2015, minus one pavilion at Cedar Street which members thought obstructed the view across the plaza. Among the residents and architects who came to speak on 28 Liberty last night were preservation advocates and museum professionals concerned about Fosun’s plans. Like the CB1 board, Docomomo particularly opposes the planned stair enclosure at Cedar Street, pictured above. Although CB1’s board does not recommend the Cedar Street plaza to be built, it still could rise, as the community board’s voice is purely advisory. “The Cedar Street structure is the most egregious of them all,” said Kyle Johnson, Marvelli’s fellow board member and architect at Snøhetta. 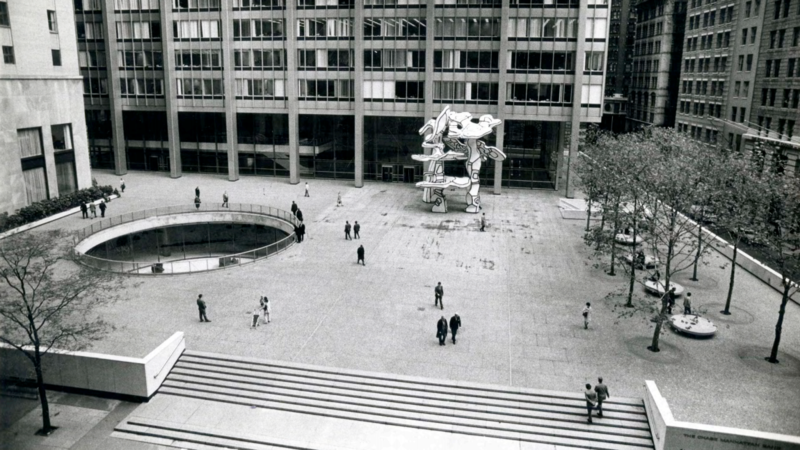 To him, the pedestrian continuity between four public plazas—28 Liberty, 140 Broadway, Zuccotti Park, and the WTC memorial plaza—is intrinsic to the overall experience of the plaza in question, and the pavilion at Cedar Street would disrupt this relationship. 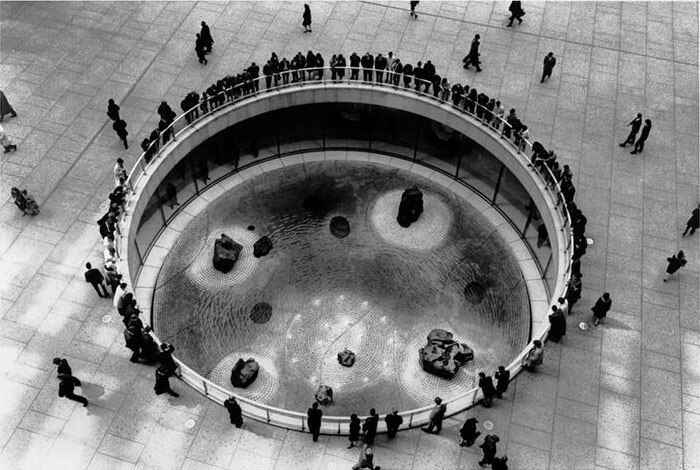 Johnson questioned the overall purpose of the pavilions, speculating that their purpose is mainly to advertise the retail beneath. “The access to the proposed retail is already there—how many doorways do you need?” Plans show there will be access to below-grade space from Pine and William Streets (and through the building itself). One leader on the board was influenced by the developer- and board-led site visits. Chair Anthony Notaro said that they added to his understanding of the design and the developer’s desire for a modification. For him, the design and the deed are definitely related, but the deed restriction is something the board should weigh in on. He advocated for a deeper understanding of how modifying the deed restriction could impact the use and appearance of the plaza in the future. In light of the Rivington House deal, reforms to the deed modification process are being worked out by the city, with some elected officials favoring a process that would subject deed modifications to a ULURP. The legislation is being reviewed by the City Council’s Committee on Governmental Operations tomorrow morning. In light of the chair and the public’s comments, the board voted overwhelmingly to re-table a tabled resolution from July on the modification of the deed restriction for 28 Liberty, at least until October.